Shimmering fabrics, funky designs, quirky straps, mysterious lengths, heels to ponder, there are lots of stuffs which make every women footwear unique and lovely in different occasions. Don’t you think so? And after such long period of emergence of slippers, they have always evolved themselves to get up with something new every time. The best thing they proffer is that they can be worn with various designer salwar suits, sarees, western dresses and pyjamas as well. You have to try new looks of footwear to understand and enjoy the trend of designer juttis and footwear. I have enlisted few points on how to talk with your footwear and designer ethnic wear below. Sarees are the intrinsic part of Indian ethics and culture. Some rules are just made to enjoy! Isn’t it? Grab designer sarees or Bollywood styles sarees and wear it with platform peep toe heels. Make the fall a little higher so that it won’t fuss with the heels. And choose similar colours with that of sarees but in lighter shade. Women can’t get enough with salwar suits and thanks a ton to designers and their magical ideations! We all wonder the pleats and form made by Patiala suits. They are so comfortable to wear yet so royal. To catch that desi look, mojaris are a must and must be worn with jhumkas or some heavy looking hanging earrings. Mojaris showcase the exquisite thread work by our Indian skilled craftsmen. Little adheres such as ghungroos, straps add to their royalty. We all love Bollywood dresses and when they strut on red carpets with those magical drapes are just like ‘WOW’. Same or little bit more happens when they adorn their desi look with designer salwar suits. 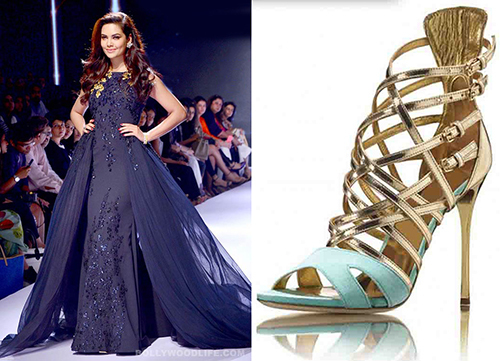 Bollywood actresses give their own style twist to the dresses making it extra special. Wear suits like them by going completely gaga with pencil heels. Ethnic gowns are just too sweet for every occasion and thus loved by all. Adorned with embellishments, marvellous embroidery or giving a signature touch, these ethnic gowns get attraction by many fashion enthusiasts. You can always play safe with gladiator heels when wear ethnic longs. 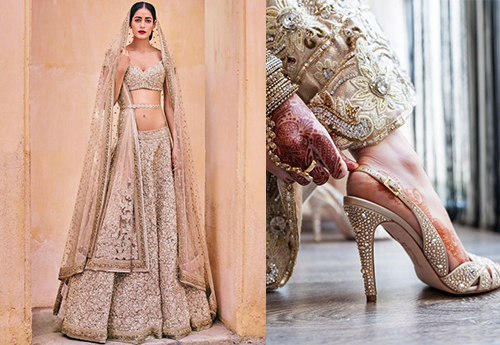 How can we forget bridal lehengas when talking of everything designer and divas!? D-day is an obvious moment to show off a little extra and we can’t go wrong on this day. It’s better to stay at safer side this time by going with studded stilettos with back holding (strap or blockage). Don’t select a too heavy lehenga for the day. Needle work juttis have become the love for many women and girls because they offer that untouched feminine charm to its wearer. Don’t we just love them? Put on your daily wear kurtis and pair them with your regular denims and needle work jutti. Be it formal, casual or evening party, you will sway your way to the limelight. 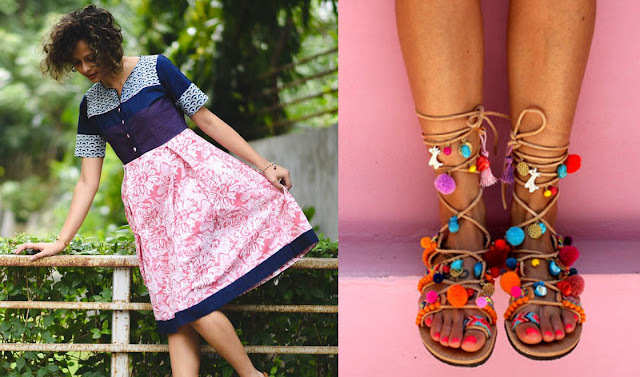 You need to select a little midi dress to flaunt the crafting of pom pom sandles. This festive season, call for ethnic worked or cotton frocks as show in the image and adorn your feet with these beauty pairs. Open up your hair and show that rustic charm with terracotta earrings.